The genus Sphaerorrhiza includes a small group of terrestrial perennial rhizomatous herbs, all of which are native to the Cerrado region of central Brazil. The plants of this genus are characterized by strings of unique tuberous underground structures which enable the plants to go dormant and survive during the dry season and resume growth when moisture is more abundant. The tubers are produced anew during each growing season and may be separated into individual propagules. Only four species are known with axillary flowers of white, purple or lilac. The fruit is a dry capsule containing numerous minute seeds. The plants were originally thought to belong in the genus Gloxinia. 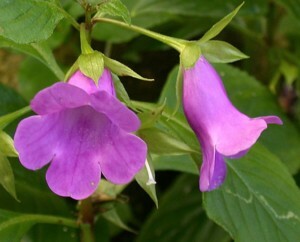 In 1976 Wiehler described the two known species as Gloxinia burchellii and Gloxinia sarmentiana. In 2002, Zimmer et al. questioned their placement in Gloxinia after molecular phylogenetic studies revealed that they were misplaced not only in that genus, but in the entire tribe Gloxinieae. (Zimmer, E.A., E.H. Roalson, L.E. Skog, J.K.Boggan, and A. Idnurm. Amer. J.Bot 89:296-311 (2002). In 2005, Roalson and Boggan transferred the two known species to a new genus, Sphaerorrhiza, and a new tribe, Sphaerorrhizeae. (Roalson et al. 2005). A recent study by Araujo et al. demonstrated that the underground structures are neither typical scaly rhizomes nor typical perennial tubers and have used the term moniliform tubers to describe them. They also described and reclassified two collections as distinct new species. (Arujo et al. 2016). The plants are of interest because of their unusual underground morphology and attractive flowers. They can be grown indoors or under artificial light and should receive little water during their dormant period. The type species of the genus is Sphaerorrhiza sarmentiana. No hybrids are known to exist.